Ficus Religiosa, the tree under which Gautama Buddha is said to have become enlightened, is one of the trees I've wanted for a long time. Although I visited many nurseries around, I didn't find any seedling, sapling or big plant of ficus religiosa in Vancouver area. So, in winter I ordered 100 seeds of this wonderful fig and I started from seeds some plants. The common names are: “bo-tree fig” “sacred fig” “aswattha fig” and “peepul fig". Although my religion is Orthodox Christian, I respect everyone's religion and I really wanted to have in my house one tree considered a sacred-tree in both the Buddhist and Hindu religions. Ficus Religiosa is not only decorative, it is used in traditional medicine for many disorders. 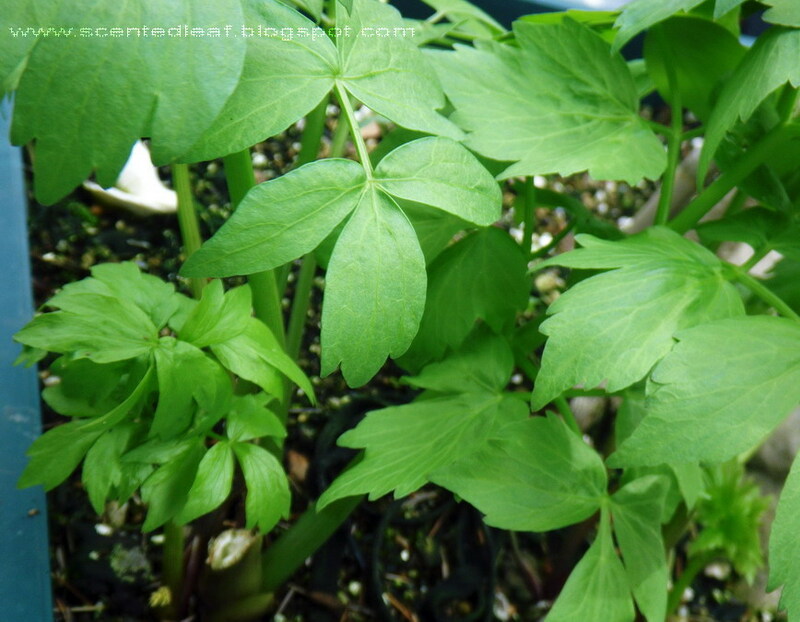 The roots, the fruits, the leaves and the young shoots have been used for years for the treatment of ulcers, stomatitis, asthma, skin diseases or to heal wounds. 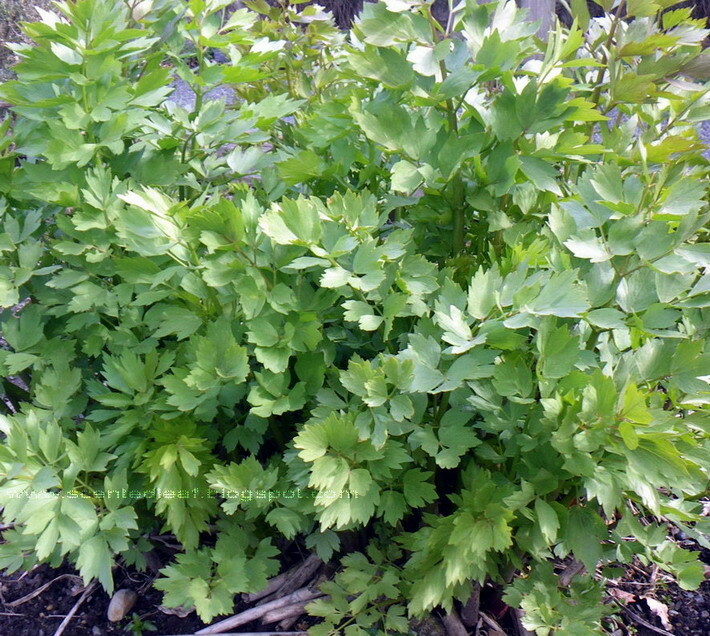 Also some said that are good for lumbago, gout and to promote digestion, in the tratment of diarrhea or gastric problems. I didn't try any of these, but I'll keep in mind some of their potential medicinal uses. 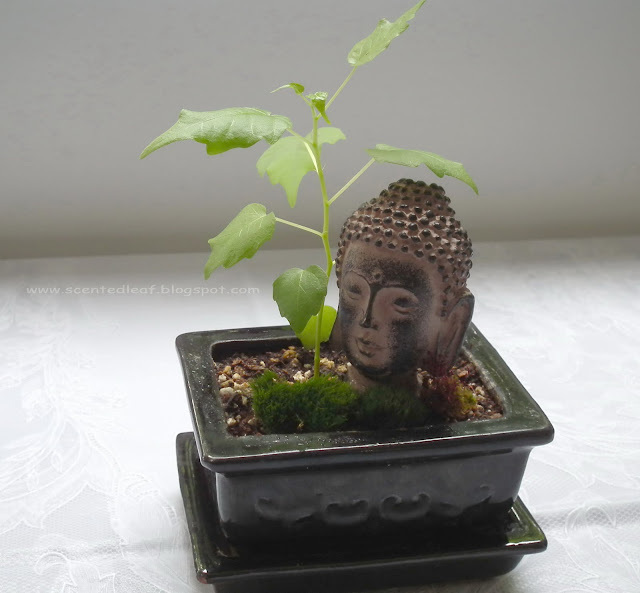 The sacred fig makes a good houseplant or bonsai. It seem to be a slow but easy way to grow them from seeds, in 5 months having just 10 cm high. 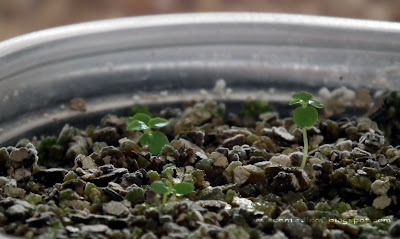 They need lots of light all day and high humidity, so, I started the seeds in mini-greenhouse under the artificial light. 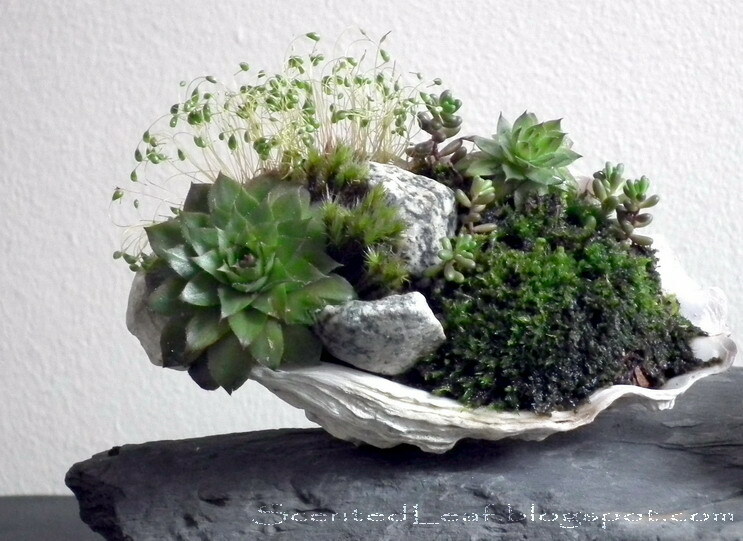 I planted them in perlite (instead of organic soil) to maintain the high humidity and to avoid dump-off. 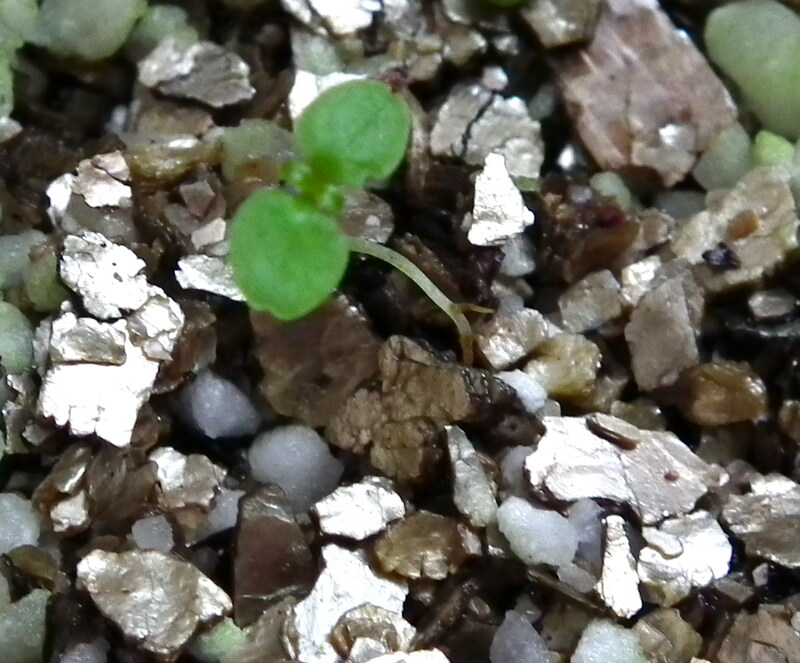 The seedling has sprouted shiny after 2 weeks and was growing really slowly, reaching only 1 cm high in one month. 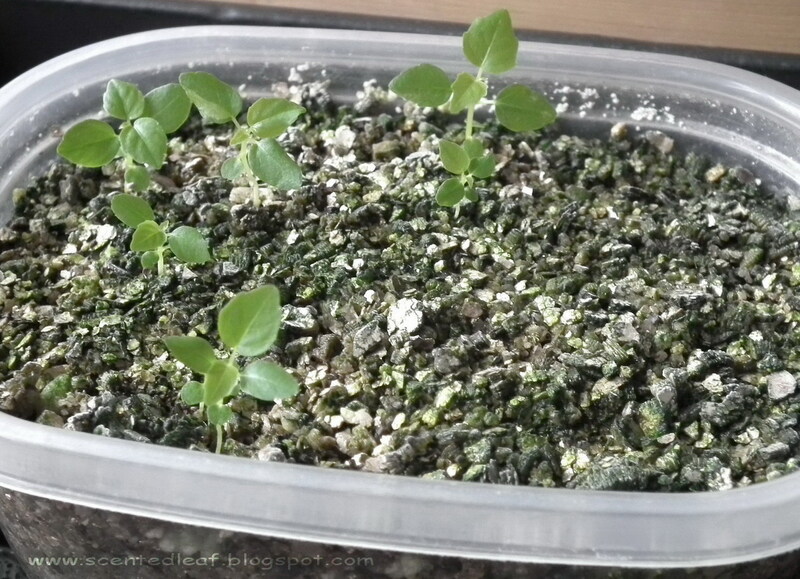 After another month, it has appeared another set of leaves to the seedlings, and the seedlings reached 3 cm high. This was the moment when we decided to change their inorganic soil with a mix: perlite, turface, peat moss, and garden soil. So, we took some small bonsai pots and planted the seedlings to them. The seedlings have been growing very slow, and not all of them survived after replanting. Anyhow, this is how are looking the most resistive of them after 3 months. Initial sets of leaves were rounded and I was worried about the seeds ordered, but my concern is gone, once I saw their last sets of leaves which have the clearly heart shaped leaves and smoother sides like the leaves of the Ficus Religiosa trees. It is still long way until the trunks and branches will be covered with power bark and the trees will produce fruits...but we have patience! 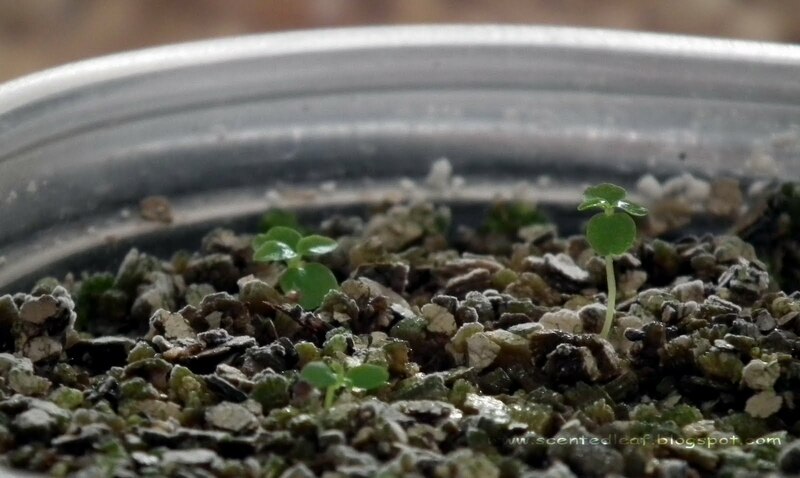 And since I don't need twelve Ficus Religiosa seedlings, I was planning on keeping two-three home (spare in case that something happened to one) and leaving whatever else sprouted to be sold. Let me know if are you interested about them. 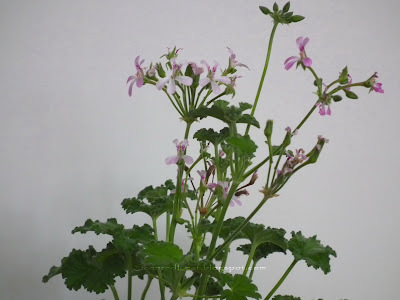 Just cream / soften one stick of butter and blend in 2 tablespoon chopped fresh scented leaves of mint scented pelargoniums. Optional add one tablespoon of lemon juice and few gratings of lemon zest. 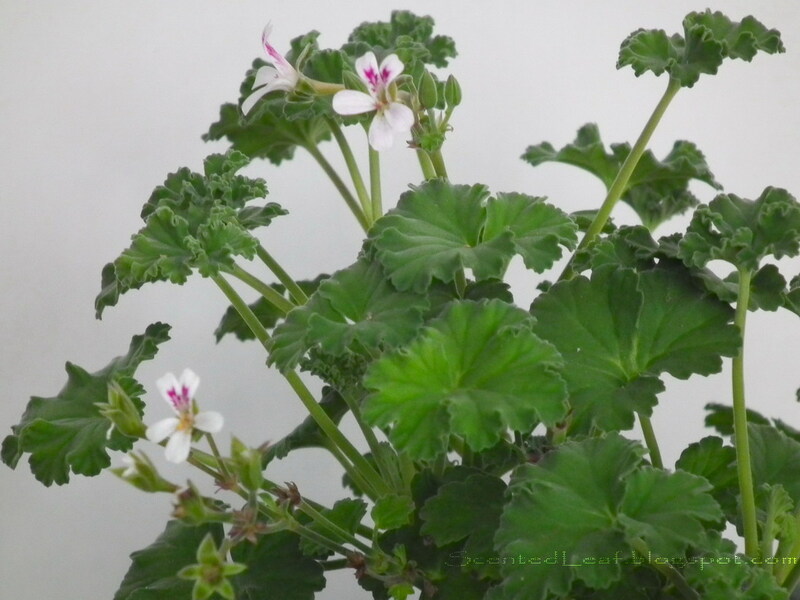 I use to portion them in small pieces, peanuts-shaped and to place them on pelargonium leaves, especially when I want a decorative presentation. Herb butter is great to be served after stand few hours to absorb the flavor of the herbs, then may be chilled or frozen up to 3 month. 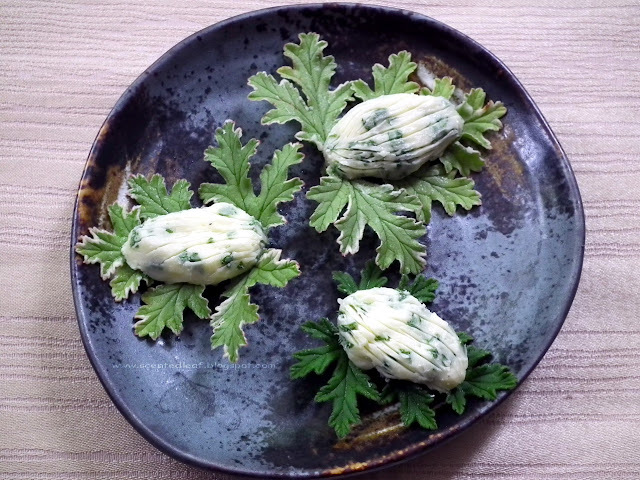 I used also fruit scented pelargoniums leaves (especially citrus scented ) to make herb butter, but I prefer to feel the mint aroma into aperitifs . 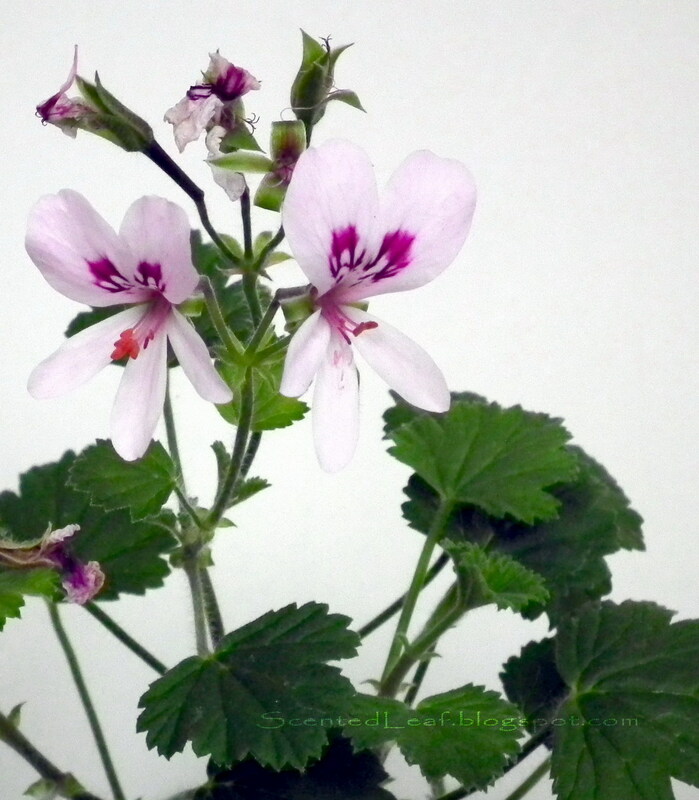 At this time, I have in my garden 3 different mint-scented pelargoniums, which are a delight to grow. One of their basic flavor is mint, but each of them has also other overtones: rose, lemon, cocos, chocolate. 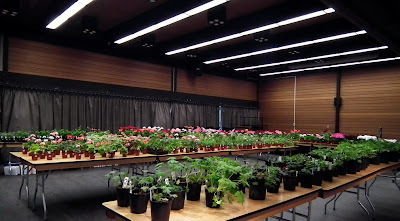 We are growing them outside in spring, summer and autumn, in Vancouver's mild climate (in winter we bring them inside to protect them by winter frost). "Chocolate Mint" has three lobed large leaves with one big brown splotch in the center of every leaf. 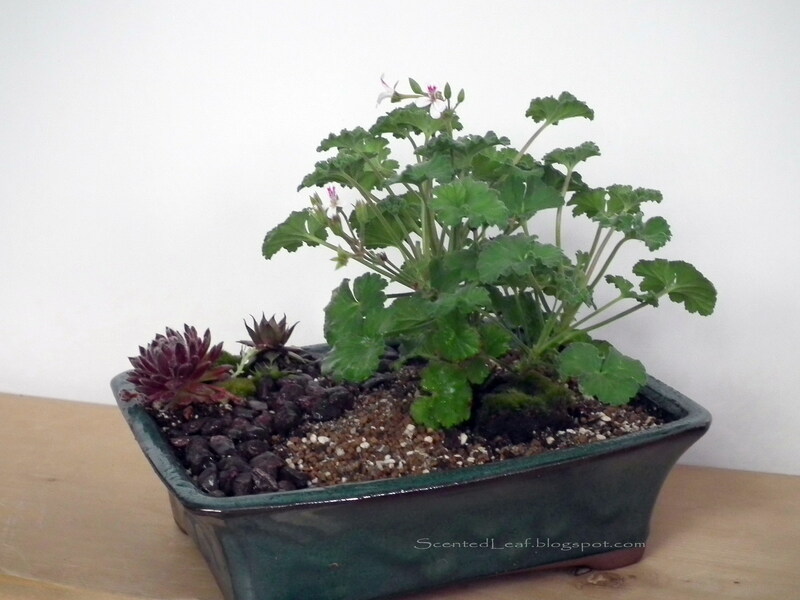 The foliage has a pungent minty scent with chocolate undertone. (if you like chocolate with mint aroma, for sure will love its taste). 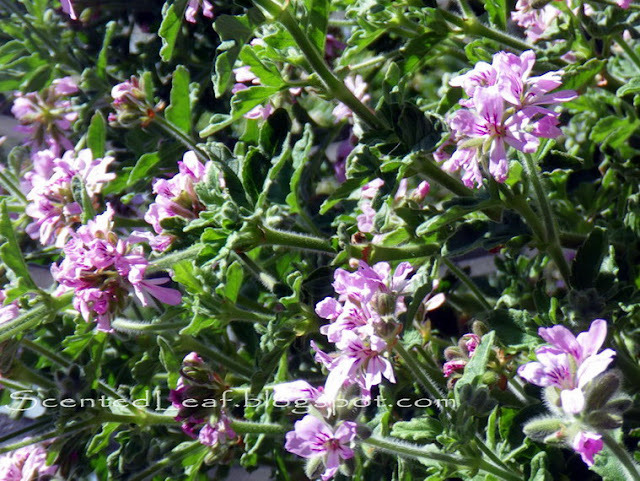 It is a large and vigorous growing plant with blooming lavender flowers which may grow several feet height and width. 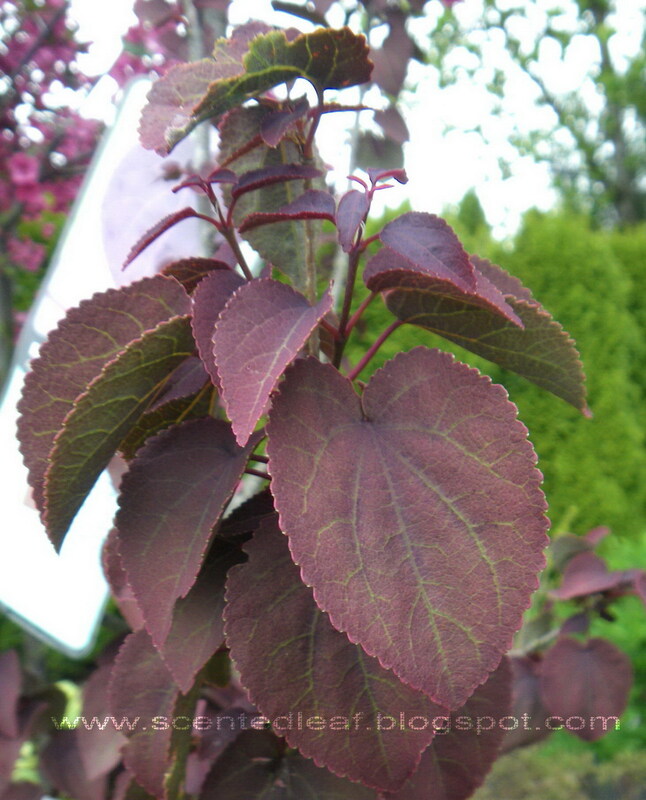 "Cocomint Rose" has a very decorative leaf with a leathery green texture. 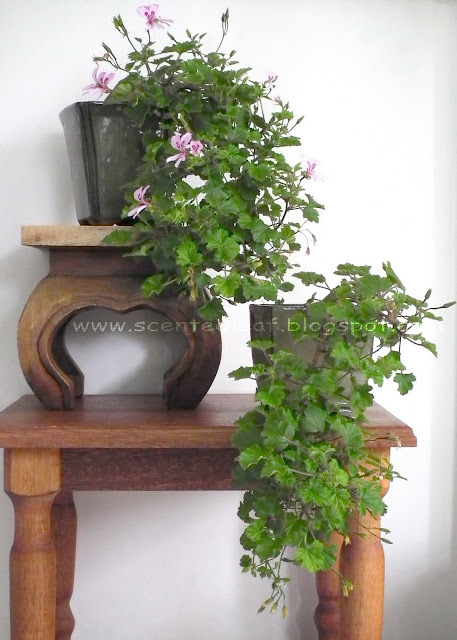 The leaves are deeply divided and have a rose-mint scent with coconut notes. 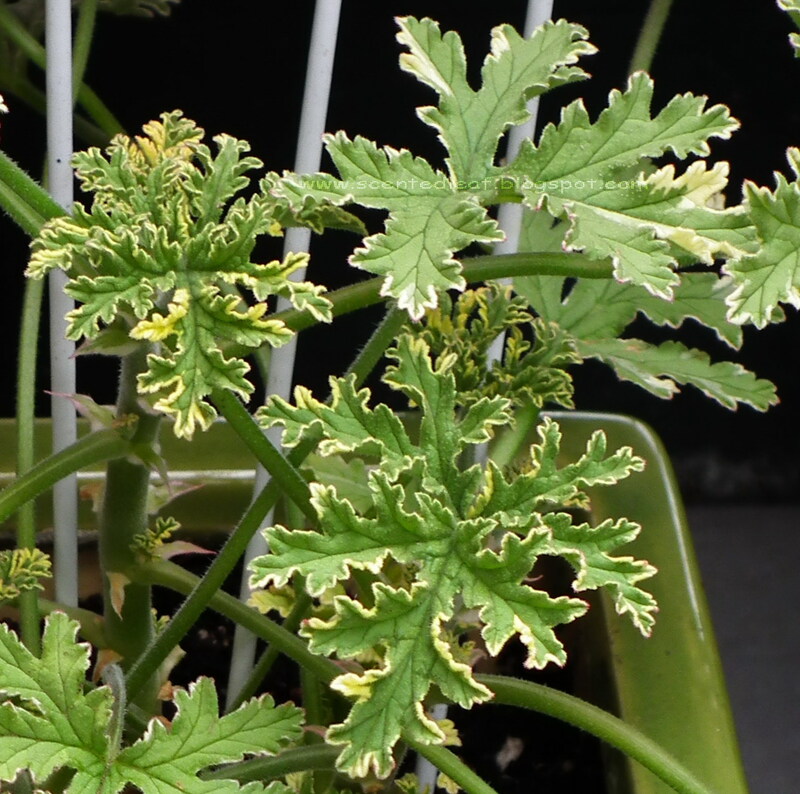 Cousin of it, the "Variegated Mint Rose Scented Pelargonium" is a showy plant with deeply divided aromatic green-grey leaves and small white flowers. The leaves emerge with yellow cream edges that fade to white - the plant looks similar with Lady Plymouth variety, but the foliage grows larger and has a different scent with lemon-minty tones. I'm still waiting to grow the real mint-scented pelargonium known as Peppermint Geranium or Pelargonium Tomentosum. I ordered some seeds from South Africa over the internet and I'm very curious to grow by myself this variety with a powerful aroma of fresh mint ..., but I'll make another post once the seedlings' velvety foliage will grow enough to occurring mint-fragrance. 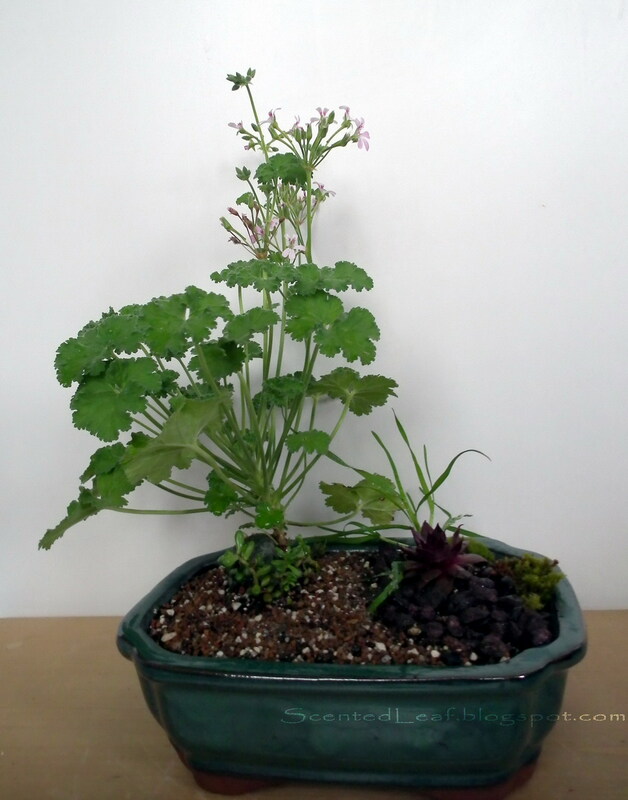 Now I'm just happy that the summer begins and my plants will grow with rapidity, giving me the possibility to use them in abundance in cooking and flavoring dishes. 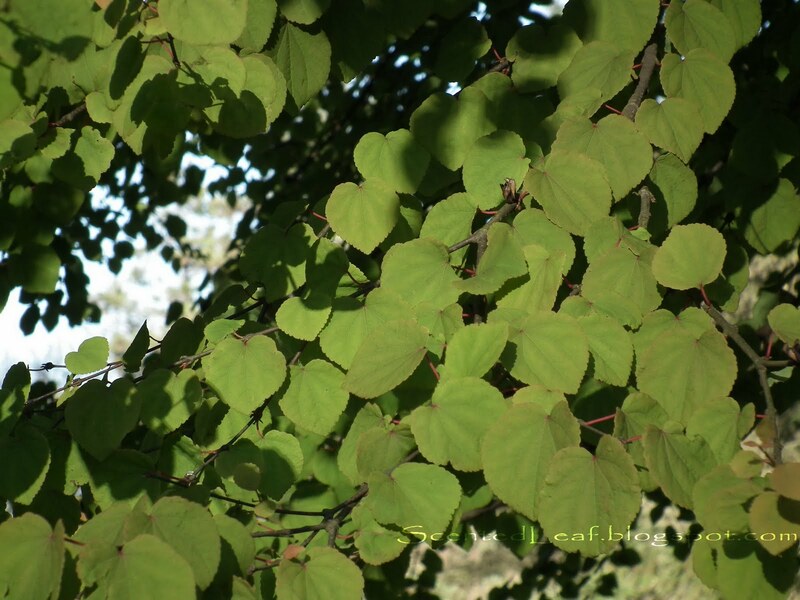 Katsura tree is the giant tree existing on the moon according to a Chinese legend. Same motif of the moon-tree exists in Japanese folk tales, also occurring in "Hagoromo" - a Japanese play, in which "Katsura tree is a kind of laurel supposed to grow on the moon". Katsura tree has one of the most colorful and attractive foliage. Its leaves are heart-shaped which emerge reddish-purple in spring, are transforming in medium green till summer and turning in gold, orange and red in fall. What I like more at this tree? Although it is not an aromatic tree, the fallen autumn leaves have a great smell of burnt sugar with cinnamon and ripe apples notes. Most of the nurseries' katsura trees are male trees, which are more upright. The female trees are more spreading and in spring are bearing tiny reddish flowers which are transforming in clusters of small seeds during summer season. 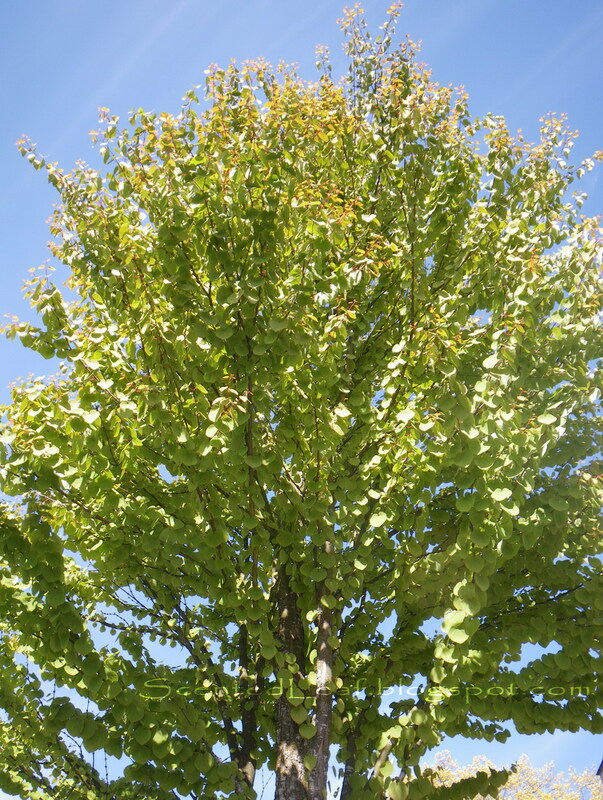 Named "Cercidiphyllum japonicum ", the common Katsura grown as ornamental tree is a deciduous tree with a dense and rounded habit which grow a large canopy in the wild (can reach 40-45 m high) but it is also very common as bonsai. 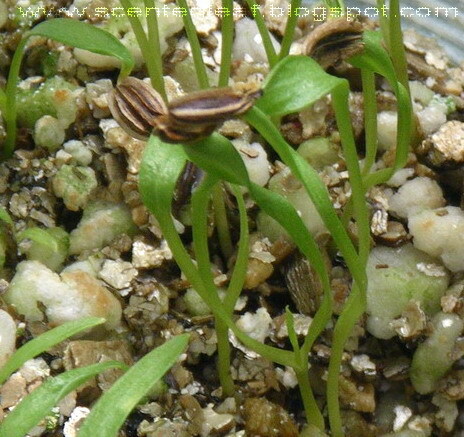 The seeds are great to be collected in late fall and need light, warmth and moisture soil to germinate. 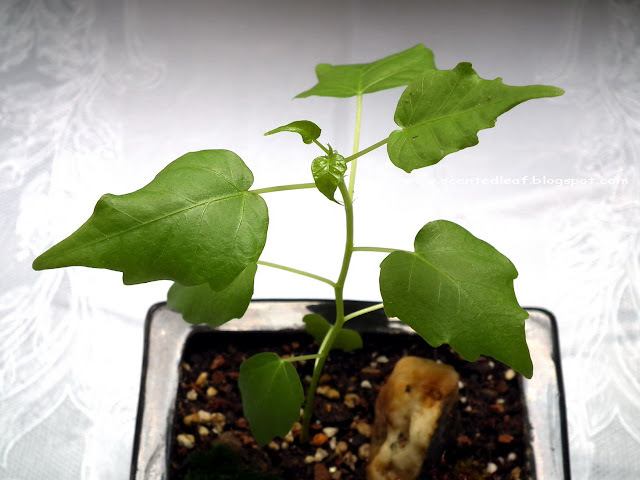 A walking alongside Katsura's trees alley from Stanley Park and an inspirational moment made us to sow some seeds gathered last autumn in our minigreenhose (artificial light and temperature around 20-24 degrees celsius). The Katsura trees are grown not only for decorative purposes. Its hard wood it is used to make chess-boards and Go-boards, and hand carved pieces of furniture. Going back to the Game of Go origins, the traditional Japanese Goban (Go-board) was made from Kaya (Torreya nucifera), California Torreya (Torreya californica), Hiba (Thujopsis dolabrata), Katsura (Cercidiphyllum japonicum), Kauri (Agathis), and Shin-Kaya (various varieties of spruce). The changing color of leaves during the year is somehow associated with its name. 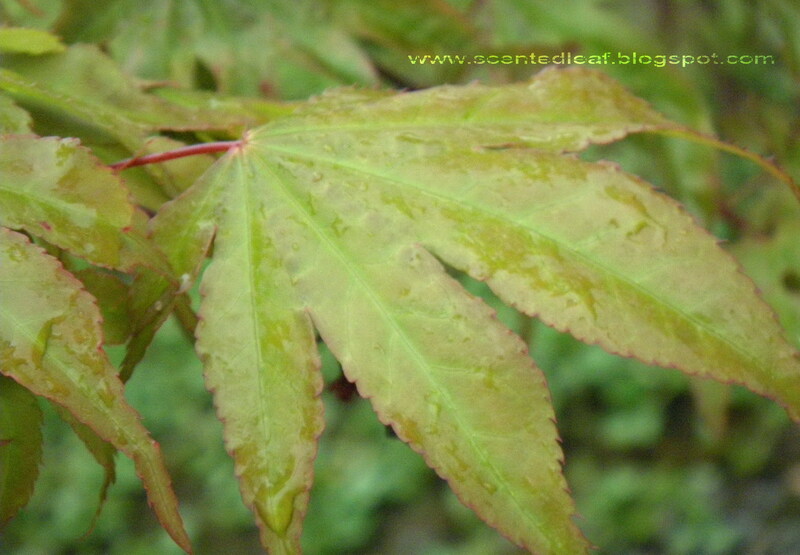 This is why Katsura name was given also to an Acer Palmatum tree with a wonderful spring color. "Acer Palmatum Katsura" is a cultivar which grows very quickly and its green-orange with redish margins foliage is a favorite of many people in spring, which turns in yellow green in summer and in burning red in fall. 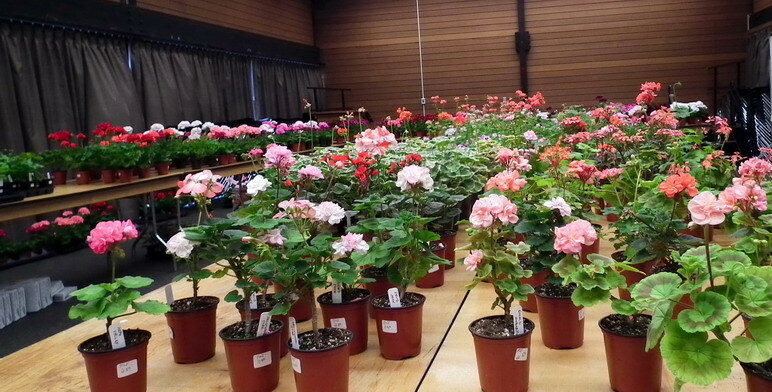 It is also very popular in garden landscaping in British Columbia, many cultivars being available in nurseries. 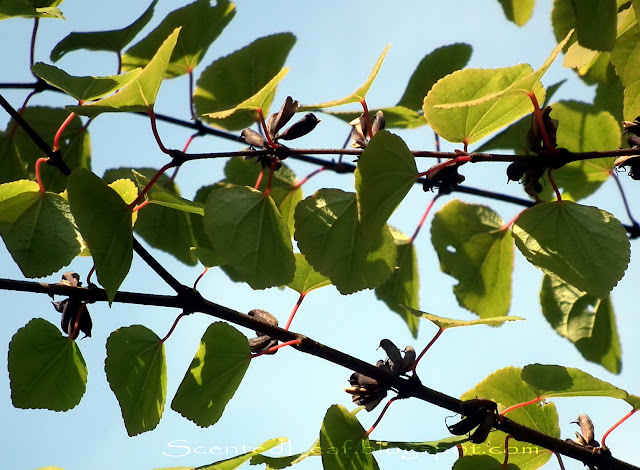 We are very fortunate to have a female Katsura tree in one of our friends backyard which provided us access to gather many of this tree seeds. Let us know if you want to buy some of them (pay by Paypal, ship next day worldwide by regular mail). 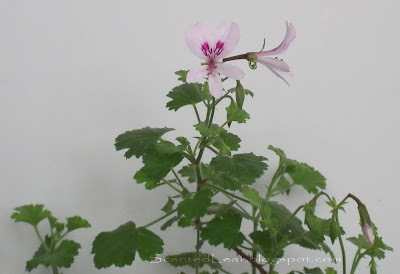 In some of my previous posts, I already told you about citrus scented pelargoniums: which are growing naturally in form of a column like Pelargonium crispum (Frensham Lemon and Citronella) and Pelargonium Citrosum: (Prince of Orange and Citrosa) and also about coconut scented geranium aka pelargonium grossularioides or Pelargonium parriflorum. All of them have small and smooth leaves and strong, crisp scent. This year our collection of scented pelargoniums, geraniums was enlarged with few more varieties: Pelargonium Odoratissimum 'Apple' aka Apple scented geranium; Pelargonium "Pink Nutmeg" and Pelargonium x Fragrans " Tutti Frutti". All of them seem to be prolific bloomers, being covered with white or lavender blossoms all the spring and the summer. 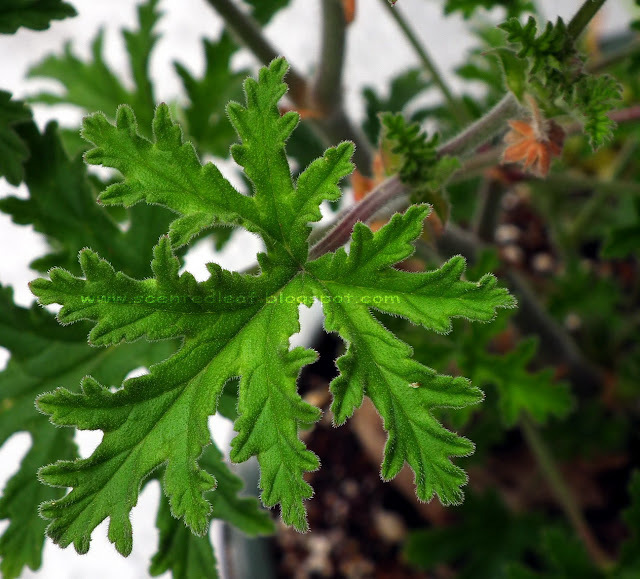 The "Apple" scented pelargonium , as the name suggested, has rounded, slightly crinkled leaves with a strong apple scent. 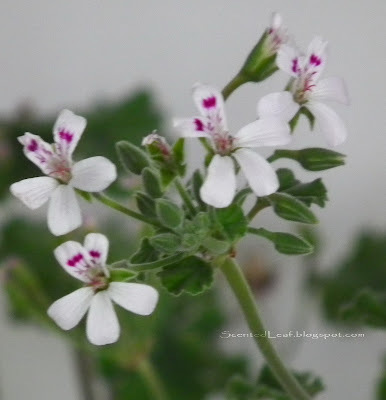 It is a spreadable plant and has tiny white flowers on long, sprawling stems. The "Tutti-Frutti" variety is a compact growing plant which has a delightful fruity-spicy scent. Derived from P. x Fragrans ( similar with "Old Spice" variety), this plant has small, soft and crinkled leaves and is a delightful dwarf scented pelargonium variety. The " Pink Nutmeg" variety has rounded, fan shaped leaves with nutmeg-spicy flavor and a slightly chocolate undertone beneath the nutmeg fragrance. All of them are sweet-smelling evergreen perennials sensitive to over-watering which love to be situated in a spot where the morning sun is generous with their leaves. 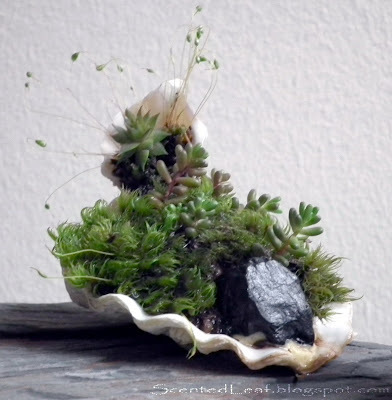 If I'm thinking more, all of them are spreadable plants with a lot of leaves and with no stem, so it is best to keep these charming plants arranged as miniature gardens (don' t you like to see a fruit scented saikei ? ;-) ). It is really intriguing the way they smell when you brush any fruity scented leaf. 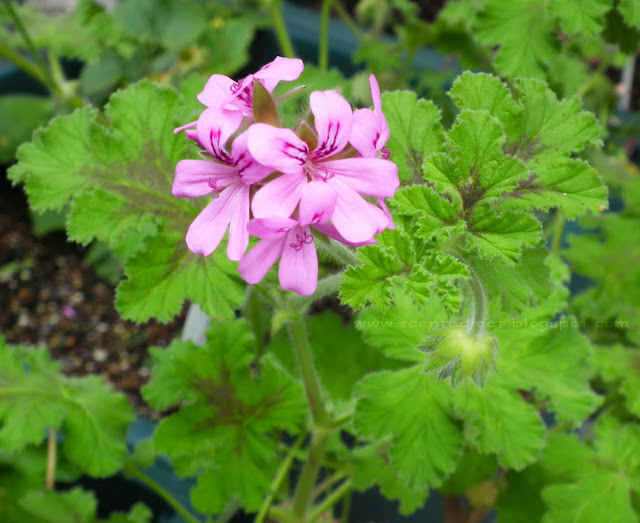 I like to add more varieties of scented leaf pelargoniums, geraniums to my garden, even some of them are difficult to grow in Vancouver's climate. Their leaves can be dried and used in potpourris or placed in sachets, so I'll dry some of the trimmings for my next projects. At the 2011 Annual Plant Sale of the Canadian Geranium and Pelargonium Society was a great pleasure to admire the vivid colors of the blooming pelargoniums and geraniums. 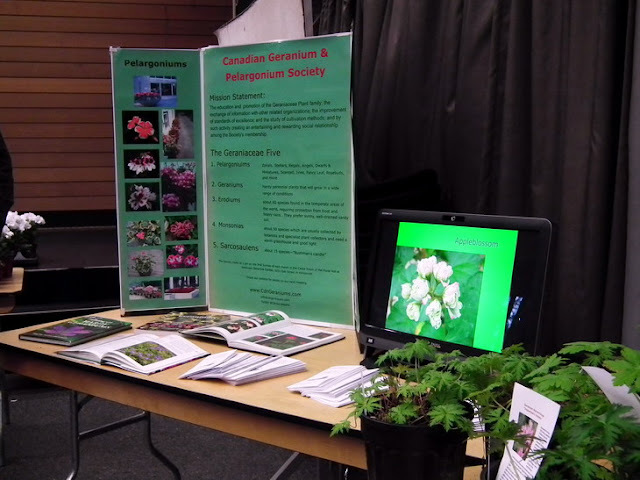 The event was held at the Floral Hall of VanDusen Garden (5251 Oak Street at 37th Avenue) in Vancouver. It was a lot of work to organize such an event, but the result was rewarding. 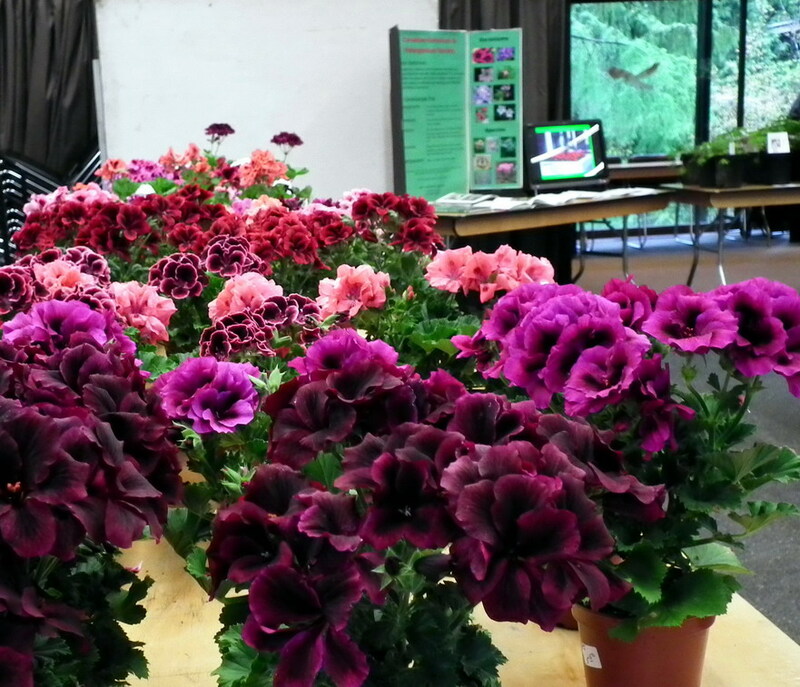 Although Saturday the weather was so capricious with a lot of showers and wind passages, including two ice-storms, the visitors arrived in groups and took home most of the plants from the show. They were pleased to buy true species plants and to obtain a lot of information about the plants and how to care each variety based on their needs. 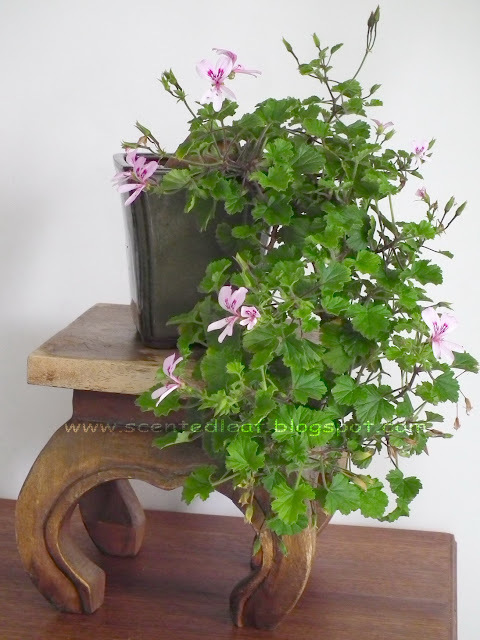 One of the most pleasant "tasks" of the show was to prepare, three weeks before, one miniature garden in a bonsai pot for our hourly door prize with a regal pelargonium with a lot of flower buds. 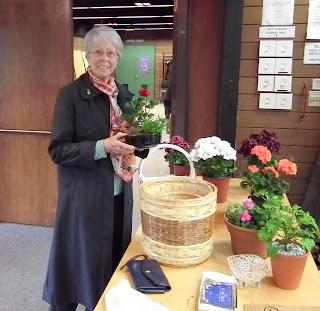 (as we told you last month in our article 2011 plant sale of canadian and geranium society. ) 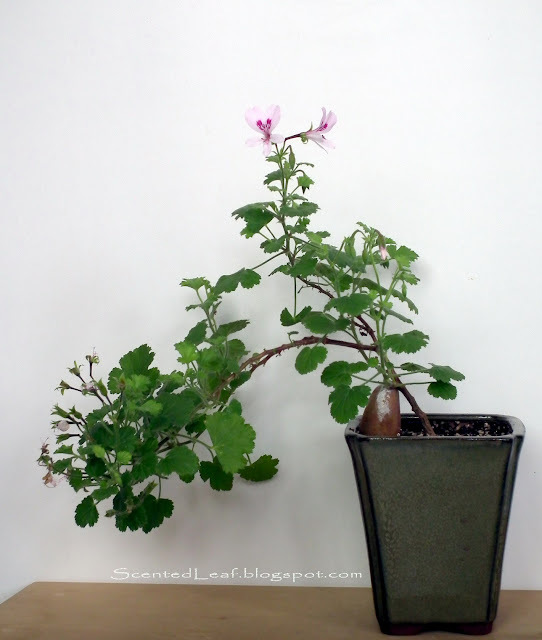 Unfortunately its flower buds still waiting to bloom (was such a cold weather here in Vancouver this spring) so last week we decide to bring other miniature garden with a blooming red geranium for the hourly raffle prizes. The plant is an "Eric Hoskins" zonal pelargonium- hortorum with dark zoned leaf and tuft red flowers which will bloom all the summer. 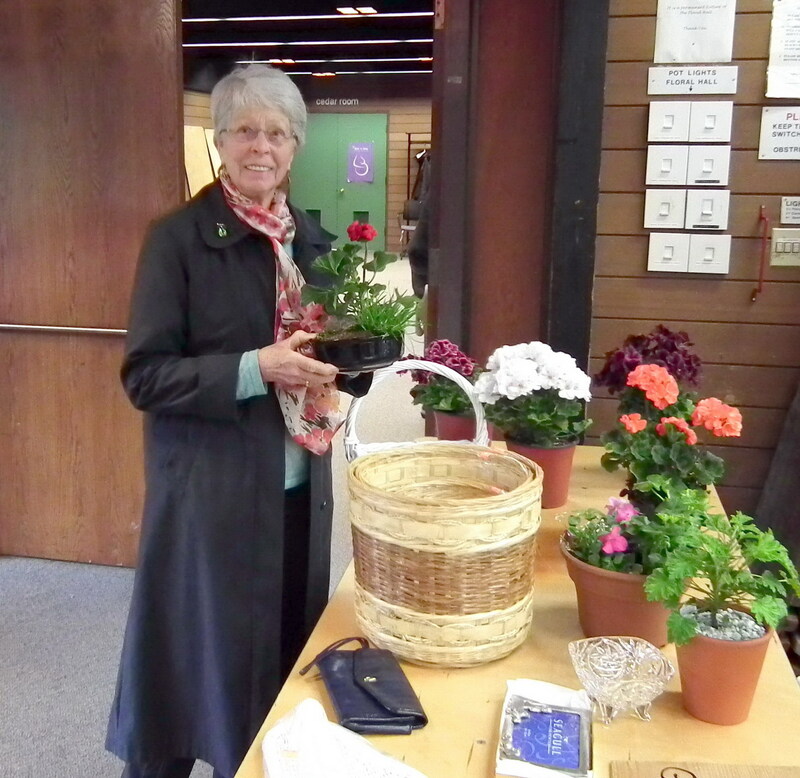 The first drawn winner of the raffle tickets was really happy to take home the "mini-garden prize"... and to take care of it for long time. Congratulations !!! 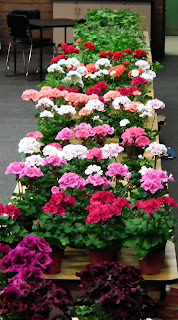 As every year, The Annual Plant Sale and Show of the Canadian Geranium and Pelargonium Society was a great opportunity for all the participants and visitors to see a wide variety of common or unique pelargoniums and geraniums, and to add some of them to their collections. I wish you were there to see and smell them... It has been an unforgettable experience. 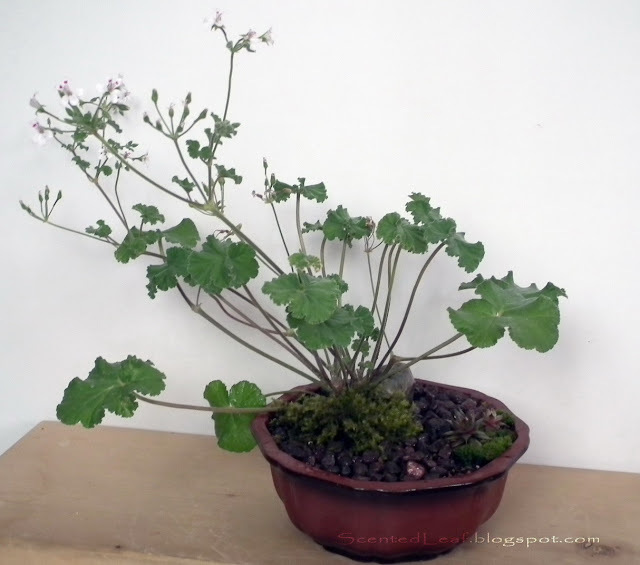 Scented Pelargonium (Geranium) "Marie Thomas" is a very good plant to be trained as cascade bonsai - this is our opinion... based on the results seen in the next photos. 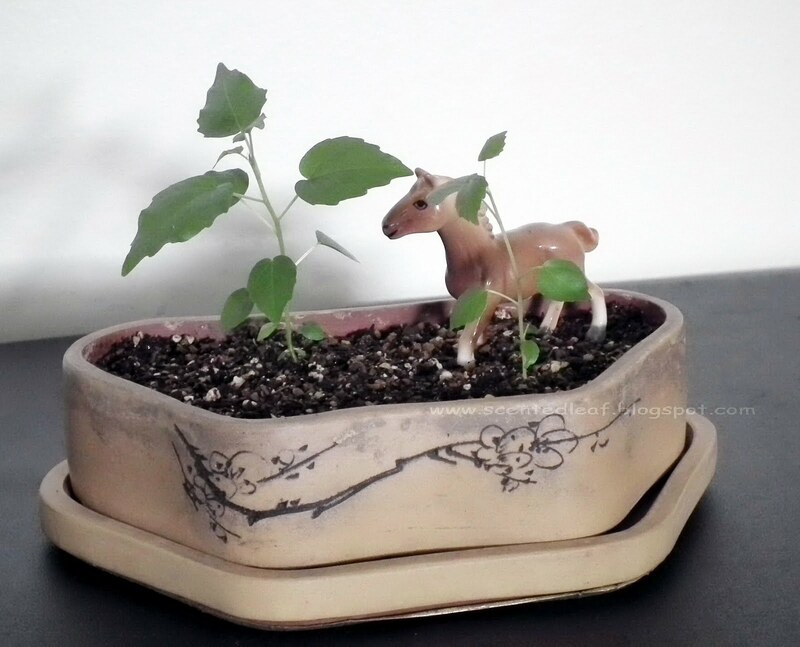 As you already know, we prefer controlling their size and shape, keeping them in bonsai pots and pruning during the growing season. 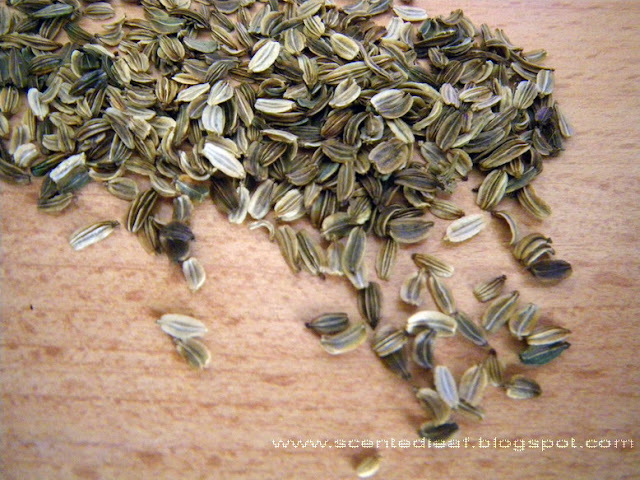 The trimmings can be utilized in potpourri, scented sachets and cooking - (believe me - you may enjoy one of the best scented sugar if use their leaves to flavor sugar). Although it is not a common variety of scented pelargonium/ geranium, most people grow them for their aromatic and persistent/ evergreen foliage. It is an overlooking fragrant plant which make a nice addition to any house (when is kept indoor) or scented garden. Don't you like such an edible scented miniature bonsai? My mother sent me a picture with her garden and like always she has an unbelievable scented garden full of flowers. When I was child I thought that her wonderful smile made her flowers to bloom all year and I'm happy that I was raised with affection and patience to love plants in her "House of the Ever-Blooming Flowers". The weather was more friendly in Europe... in Vancouver seems to be a spring without end this year and my scented pelargoniums still waiting warmer days to bloom ... I miss their flowers so much! Mother's Day is celebrated all over the world to honor our Mothers, although the dates and months of Mother's Day differ from country to country. In Canada and in my native country, the Mother's Day is celebrated in the first Sunday of May. Happy Mother's Day to our moms! Mother's Day is the occasion to pay rich tributes to one of those persons who have had a great impact on our lives, a person whose love and care knows no boundaries, a person who does everything to keep us happy and joyous. The custom, in Canada, similar to all customs in the countries that celebrate this day, is for men and children to give the women in their lives (mothers, wives, sisters and teachers) flowers or gifts. The idea that the female teacher is the equivalent of a mother figure prevails and sometimes they receive small gifts on this festive day, too. Special for this event, the children from our neighborhood will offer some little attentions to their mothers and their teachers. 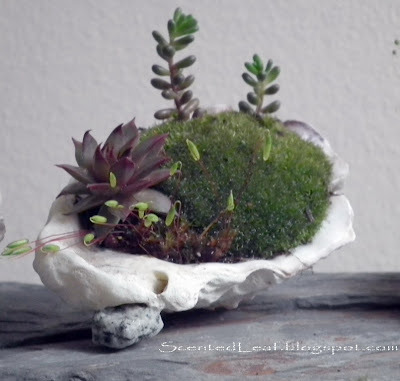 Helping them to do these small arrangements with accent plants and moss in oyster shells was a great way to bring them pleasure and to escape from our daily routine. Happy Mother's Day to all Mothers of the World!